Over 100 people protested at the AGM of HSBC on Friday, over the bank’s alleged ‘complicity in climate change, war and military occupation’. A newly-empowered coalition is going after major investors in climate change and the arms trade – with Britain’s biggest bank seen as a key target. In the last three years alone, HSBC has reportedly poured £43bn into fossil fuels, whilst at the same time investing over £830m in arms companies and being involved in syndicated loans to the arms sector exceeding £18.9bn. 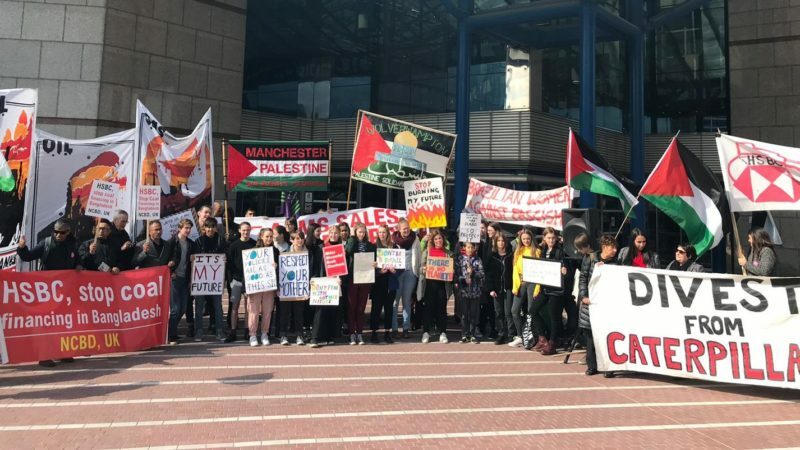 There have already been campaigning successes – with anti-militarism and pro-Palestinian rights groups pushing HSBC to divest from Israel’s biggest arms manufacturer, Elbit Systems, last December and climate groups winning tighter restrictions on the bank’s coal policy last April. But protesters say that HSBC’s policies, lending practices and exposure give cause for an escalation in action and demands. Research shows that a heating climate has been a contributing factor behind wars in the Middle East – leading protesters to assert that a cycle of war and warming increasingly binds anti-militarism and climate campaigners to the same cause. The groups highlight that in Nigeria, Syria, Iraq and elsewhere, oil, gas and coal are being extracted under the gaze of state-military and militias. “For too long now big banks like HSBC have been pouring billions into climate-wrecking fossil fuels every year. HSBC is one of the biggest fossil fuel financiers, supporting projects that not only damage our climate but also ravage frontline communities across the world. Stop financing companies that make more than 30% of their money from coal mining or coal power. Remove the exception that allows HSBC to finance new coal plants in Bangladesh, Philippines and Indonesia. Publish a time bound plan for phasing out financing of fossil fuels and increasing finance for renewable energy. The protest comes on the day that young climate strikers again take to the streets to draw attention to environmental chaos. HSBC have been contacted for comment. There is only one way to stop bankers financing war and climate chaos, nationalise the banks and put them under democratic control. “nationalise” means the government owns it, is that the govt we all love? and that govt does own plenty of banks and big parts of banks, since the bank crash of over 10 years ago, but of course “democratic control” doesn’t exist anywhere and especially nowhere near the dam banks which need abolishing actually not giving to the dam govt! The neoliberal EU Single Market regulations do not allow nationalisation !! !